Probably the question I get asked more often than any other about Steelhead fishing is what is the best bait for Steelhead? My answer is all of them. There is a time and a place for everything. 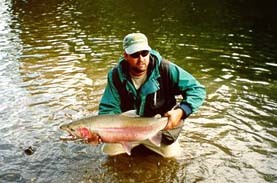 Many factors contribute to whether or not a Steelhead will bite a bait at any given time. 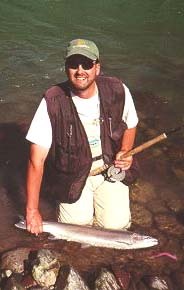 Steelhead are a fish that can be very predictable one day and then completely defy any logic or reason the very next day! I feel that the best way to approach a days Steelhead fishing is to have a selection of baits and lures and to take turns rotating three or four of them through each and every run or pool that you fish that day. Selection and changing your bait regularly is one of the secrets that make successful anglers consistently successful. 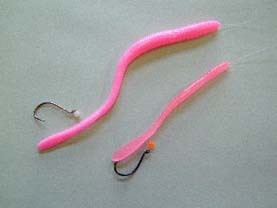 One of the Baits that I always have with me when I am fishing for Steelhead is the rubber worm. This bait is one that I feel that every angler should have as part of his or her angling arsenal. If you are not fishing the worm you are missing out! Over the years many anglers have told me that they have had little or no success with this silly looking bait. I feel that these anglers probably don't have much confidence in this bait and don't spend much time fishing it or they don't know how to effectively fish the worm. This lure is really no different than any other. You fish it under a float just like you would a gooey bob or a piece of roe. The main difference with this bait is that it causes a fairly instant reaction from the fish. They ether attack or they get out of the way. Because of this reaction response I usually fish the worm as the last bait through each spot. The other important tip to remember is that you don't have to spend much time fishing the worm, if they want it you will know it usually in very short order. My motto is, fish it fast and fish it last! When it comes to worm selection the most common question is what is the best color? Rubber worms come in more colors than you can imagine. The most popular colors are different shades of pink, orange, peach and red. Some anglers have had good success with worms that are a natural or purple color as well. The best advice I can give here is to experiment but if in doubt start with pink (bubble gum) it seems to work just about everywhere. 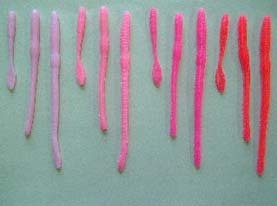 Worms come in a variety of sizes, the most common are 6inch and 4inch both work well and a few of each is a good idea. When you decide to hit the river you should tie all of your worms the night before. For this you will have to visit a sewing store and purchase a needle that is 6 inches long, with this you can work you leader about 3/4 through the center of the body and then tie on the hook. Do not try to hide the hook in the worm; instead let it dangle at the tail. 10lb or 12lb leader and size1 to 2/0 hooks are perfect for rigging these baits. Most anglers that I have talked to seem to feel that worms are most effective when the river has some color to it, personally I never hesitate to fish my worms no mater how dirty or clear the river may be. Remember that to effectively fish the worm, fish it in every spot you fish in, don't spend much time fishing it, just cover all the good spots a few times and them move on. Is the rubber worm the ultimate Steelhead bait? Nope, there is no such thing, but they are very effective when fished properly and should be an important part of your steelheading arsenal! Remember the key to successes with the worm is to Fish it fast and fish it last. By the way if you do find the ultimate Steelhead lure, one that works every time in every possible condition be sure and give me a call, we could sell it and make a fortune!